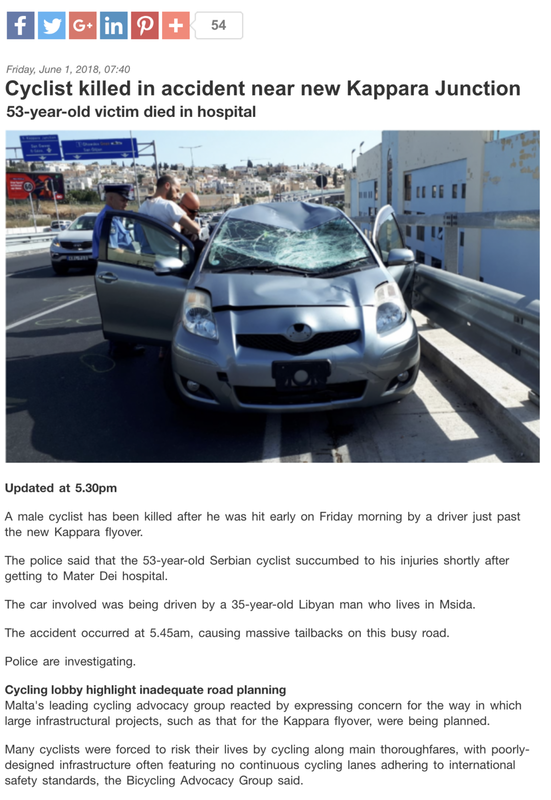 Following the tragic accident this morning where a cyclist was hit and killed on the new Kappara flyover, the Bicycle Advocacy Group (BAG) expresses its deep concern on the way mega-expensive road infrastructural projects are being designed by Transport Malta. As things stand, people who wish to commute by bicycle have very few options but to use main thoroughfares in order to reach their destination, putting their lives in danger as a consequence because of poorly-designed infrastructure and in many cases, the absence of continuous cycle lanes which adhere to international safety standards. BAG was contacted by the Minister for Transport, Infrastructure and Capital Projects Hon. 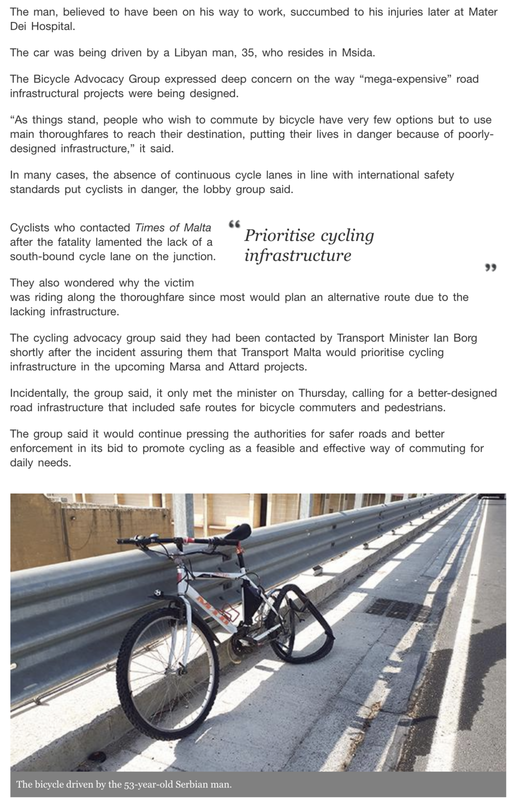 Ian Borg just this morning whereby he assured his intervention with Transport Malta so that cycling infrastructure is prioritised in the Marsa and Attard projects. Incidentally, BAG held a meeting with the Minister yesterday 31st of May, calling for the need of better designed road infrastructure which includes safe routes for bicycle commuters and pedestrians, in this way ensuring that sustainable modes of transport are encouraged. BAG will continue pressing authorities for safer roads and better enforcement in its bid to promote cycling as a feasible and effective way of commuting for daily needs.